The Alberta government is investing in new MAX transit lines throughout Calgary to offer faster, more efficient ways for Calgarians to get around. 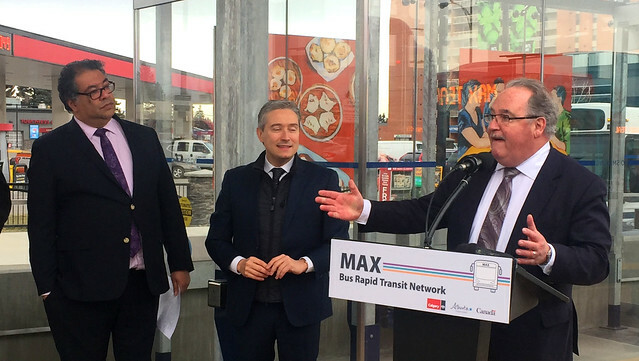 (L-R) Mayor Nenshi, federal Minister of Infrastructure and Communities François-Philippe Champagne and Minister Mason help launch Calgary’s new MAX rapid transit bus lines. The City of Calgary, the Government of Alberta and the Government of Canada are pleased to announce the opening of three new MAX rapid transit bus lines. Service on MAX Orange, MAX Purple and MAX Teal begins on Nov. 19, and will benefit hundreds of thousands of Calgarians living across all quadrants of the city. A fourth MAX route in southwest Calgary is currently under construction and will open for service in 2019. The Government of Alberta has committed a total of $116.2 million to the MAX Orange, Purple and Teal rapid transit bus lines. An additional $43.7 million has also been dedicated to the future southwest MAX route. The City of Calgary has also allocated close to $76 million to these projects from the province’s Municipal Sustainability Initiative grant, bringing the Government of Alberta’s investment to a total of $235.9 million. Over 320,000 Calgarians living across 53 communities will have access to this enhanced transit service, allowing them to travel across the city, and easily access key destinations such as post-secondary institutions, employment centres and hospitals. Service on the new lines will run every 12-18 minutes during peak times. The infrastructure includes queue jumps and dedicated bus-only lanes to bypass traffic, providing customers with consistent and reliable service. MAX stations also offer an enhanced customer experience with larger platforms, heated shelters, improved lighting, wayfinding signs and next bus arrival time displays.